At first glance, the words “garbage enzymes” sound like they have no place in the same sentence as “cleaning product”. But, before you click on to the next page, we encourage you to finish this article and open yourself up to the exciting world of non-chemical household products for cleaning use. “Garbage enzymes” is probably not the best term to describe this amazing multi-purpose DIY cleaning product. What we’re really talking about here is an acetic acid derived from cooking unfermented fruit and vegetable scraps along with brown sugar and water. The result is a powerfully effective, all-natural and eco-friendly cleaning product, costing next to nothing. To find out how you can make your own garbage enzymes for home cleaning use, read on. A plastic, wide-mouth bottle with an airtight lid (rinse it out thoroughly). ½ cup of brown sugar, jaggery or molasses. Basically, the ratio is 1:3:10 of sugar, fruit scraps and water. Multiply accordingly if you want to make a bigger amount. Carefully pour the sugar into the bottle. 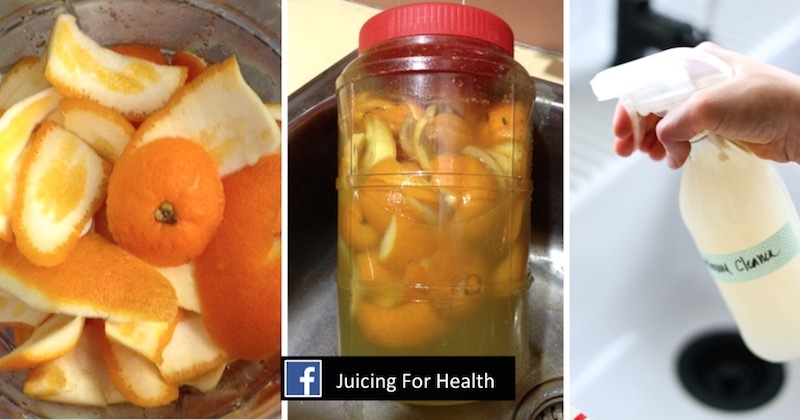 Put the fruit scraps into the bottle. Pour the water over the fruit scraps and sugar. Tighten the cap. If the container is not airtight, fruit flies and maggots may appear. Put the date on the bottle with a permanent marker. 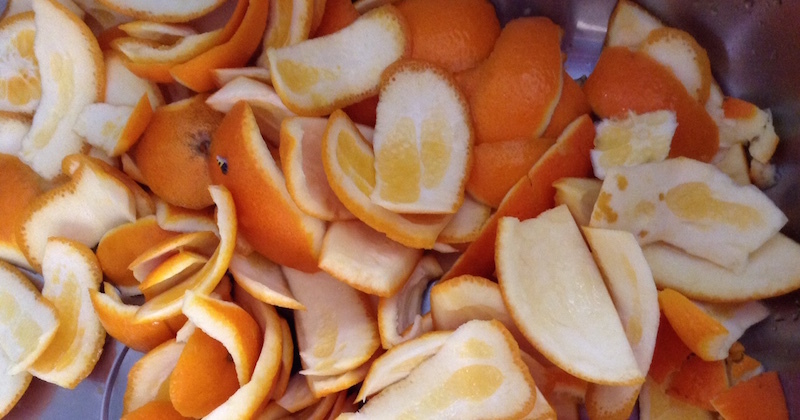 The fruit scraps have to ferment for two months before it is ready to use. During the two-month waiting period, shake the bottle every day. During fermentation, there will be release of gas so the cap has to be opened every day to release the fermentation gas. If you noticed the plastic bottle swelling, take the cap off fully in order to let the gas out. Most swelling of the bottle occurs during the first month, and a small amount of the gas should leak out due to the cap being on half tight most of the time. You may see a whitish growth on the top of the enzymes at times during the fermenting process. This is yeast and it’s normal—simply give the bottle a good shake (after you’ve tightened the cap) and mix the whitish growth in. The yeast is necessary to ferment the sugar and turn it into alcohol. Alcohol is a good cleaning agent. After two months, your garbage enzymes are now ready to use. Filter the fermented enzymes through a fine sieve. The filtered enzymes liquid is what you use for cleaning. The residues may be used as fertilizer in your organic garden. Here are some every day uses for your new DIY, eco-friendly, non-toxic cleaner. ¼ cup of garbage enzymes make a great cleaner for both your hand-washed dishes and for your laundry. Be sure to add the enzymes to your washing machine before you add the clothes, and when using the enzymes for dishes, you might want to add a touch of dish detergent to add some suds to your sink. Use a capful of enzymes undiluted and pour some onto stains, leave in to set for several hours, and then wash. Garbage enzymes have even been shown to be effective at removing blood stains from clothing. Use 1 part enzymes to 20 parts water for clean and shiny kitchen and bathroom floors. 1 part enzymes to 20 parts water makes a great fertilizer for both flowering and non-flowering plants. Be sure not to add too much enzyme. Too much may harm the plants. For a clean and shiny car, use 1 part enzyme to 20 parts water, wash and rinse thoroughly. Extra dirty cars may need a 1:10 ratio. Mix 1 part enzyme to 3 parts water, pour into a spray bottle and use as a window or mirror cleaner. If you’re interested in switching to more organic types of cleaner, give garbage enzymes a try. We think you’ll be pleased with the results.